Planets have fascinated scientists and humans in general for years, after all we do live on one ourselves. By learning more about these amazing objects that orbit the same sun as Earth, we can learn more about our own planet. The sun appears 2 and a half times larger in Mercury's sky compared to the Earth's. Saturn has the lowest density of all the planets in the solar system. It is so light that it could actually float on water if there was an ocean big enough to hold it. Venus is known as Earths' twin sister because of its similar size and proximity to each other. The Earth is estimated to be 4.5 billion years old. It travels through space at 660,000 miles per hour. Because of the strange way it spins, nights on some parts of Uranus can last for more than 40 years. Mars is red because it is rusty. There is a lot of iron in the soil, and the air on Mars has made it turn red-just like rusty iron on Earth. It takes about 29.46 Earth years for Saturn to orbit around our sun. It takes 243 days for Venus to make a rotation. And it takes 224 days for Venus to orbit around the sun. Venus is one of the most widely explored planet aside from our own Earth. Numerous space probes have been sent to Venus to gather data and some have landed on the surface. It is believed that Venus used to have bodies of water similar to Earth, but dried up over a period of 300 million years when the sun began admitting more solar energy after the sun's infancy stage. The clouds of Venus is filled with sulfuric acid. Venus has mountains that are higher than Earth. Maat Mons is more than 5 miles high. Saturn's rings are made up of billions of pieces of rocks and dust. Saturn has over 30 known Satellites, but many of them are small and faint. Saturn has no solid surface. It is a giant ball of gas, but it does have a solid inner core. The temperature difference between the poles and the equator is very small on Saturn. The atmosphere of Saturn comprises mostly of Hydrogen and Helium. He could not see the rings clearly with his small telescope and thought they were large Satellites. Titan is the only Saturn Moon with an atmosphere. Titan is also larger than the planet Mercury. Venus is the brightest planet viewed from Earth. Neptune is the stormiest planet. The winds there can blow up to 1,240 miles per hour, that is three times as fast as Earth's Hurricanes. The planet has has a system of thin dark rings but they are incomplete rings and are best described as arcs. Neptune is a sea blue color due to the methane gas in its atmosphere. Neptune once had a great dark spot similar to Jupiter. Neptune only receives 1/900 of the solar energy that reaches Earth. Neptune has its own heat source, it emits a quantity of energy 2.7 times greater than it receives. Neptune has 19 known moons. The oldest rocks in the world, the so-called St. Peter and St. Paul stones in the Atlantic Ocean, are 4 billion years old. The Earth weighs 6,588,000,000,000,000,000,000,000 tons. The earth rotates on its axis more slowly in March than in September. If the Earth were compressed to a sphere with a 2-inch diameter, its surface would be as smooth as a billiard ball's. The planet's most extraordinary feature is the tilt of its rotational axis, which is almost perpendicular to the plane of the eclipitc, which means that it alternately has its north pole and its south pole turned towards the sun. Even though Neptune is further from the sun, Uranus is the coldest planet in the solar system. Uranus has 27 known satellites. In many Asian languages, Uranus' name is translated into “Sky king star”. Uranus mass is more than 14 times larger than Earth. Uranus and Neptune are both known as Ice Giants. It is the second least dense planet after Saturn. The planet was discovered in 1781 by William Hershel. It takes 30,685 Earth days for Uranus to complete an orbit around the sun. Glaciers occupy 5.8 million square miles, or 10 percent of the world's land surface, an area as large as South America. The world is not round. It is an oblate spheroid, flattened at the poles and bulging at the equator. Neptune is 30 times farther from the sun as is the Earth. It goes around the sun once every 165 Earth Years. One of Mars' moons, Phobos, is moving closer and closer to Mars. Scientists think that one day it will crash into Mars. Mars has the tallest Volcano in the Solar System named Olympus Mons and it is 15 miles high which is three times the height of Mount Everest. Like Earth, the poles of Mars are covered in ice. The ice becomes thicker in the winter. Mars orbits the sun every 687 Earth days. Jupiter has a mass 318 times greater than the Earth's and a diameter that is 11 times larger. The mass of Jupiter is 70% of the total mass of all the other planets in our Solar System. Jupiter's volume is large enough to contain 1,300 planets the size of Earth. Jupiter rotates faster than any planet in the Solar System. But it takes 12 Earth years for Jupiter to complete an orbit around the sun. The great red spot on Jupiter is a storm that has been going on for over 300 years. You can fit 100 Earths into Jupiter's great red spot. Jupiter has a ring just like Saturn and Uranus. The Planet has over 60 known satellites (moons) but most of them are extremely small and faint. Jupiter is covered by an ocean of hydrogen with a sludge-like consistency. In 1994, pieces of a comet called shoemaker-Levy 9 broke apart and crashed into Jupiter. This left patches in Jupiter's atmosphere that lasted for many months. Some astronomers believe that Pluto was once a moon of Neptune but it somehow escaped into its own orbit. 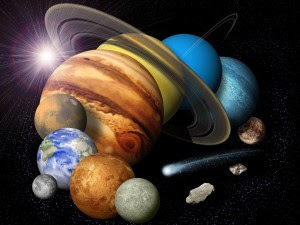 One reason why Pluto is declassified as a planet is because asteroids has been detected in our solar system that are as large or larger than Pluto. Stricter rules are now in place as to what can be called a planet. Pluto did not meet all the new requirements to be labeled as one. The Martian “day” is about half a hour longer than Earth. The thin atmosphere of Mars is made of mostly carbon dioxide. A hundred pound man would weight 38 pounds on Mars. In 1996 NASA, while studying the ALH 84001 meteorite of Martian origin found in Antarctica in 1984, announced that fossilized micro-organisms from Mars might be present in it. Valleys and Canyons on Mars suggest that the planet once had large amounts of surface water. In winter, nighttime temperatures on Mars can drop as low as -191°F. The atmosphere is made up of Hydrogen, Helium and Methane. The planet rotates from East to West. The only other planet that does this is Uranus.